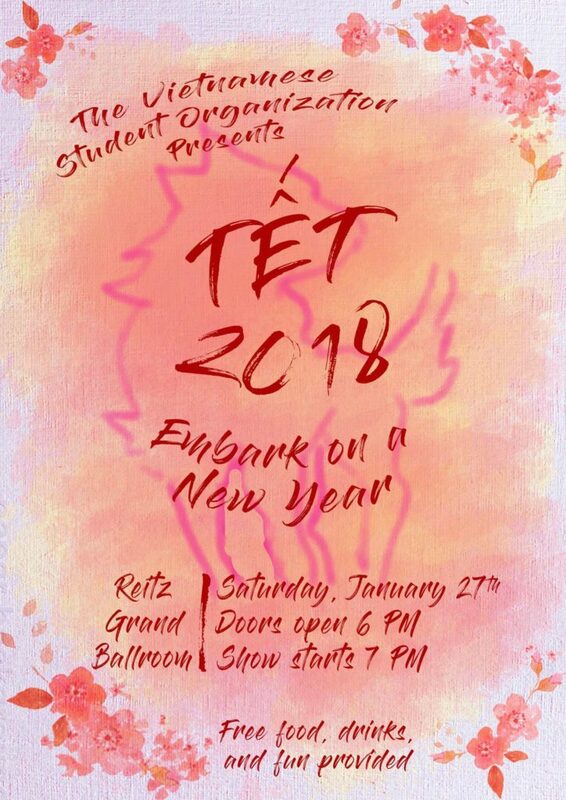 Our Tết cultural show: Embark on a New Year, took place on Saturday, January 27th, 2018 and had close to 400 people in attendance. Those who helped make this event possible were our 18 officers, 18 committee members, 34 models, 20 performers, and 50+ dancers. The purpose of the event was to celebrate the new year with friends and families by hosting a cultural show that is free and open to the public. Our goal was to educate the audience through different skits and performances about the Vietnamese culture and how Tết is often celebrated. There were multiple ways for our members to get involved in the event: decorations committee, logistics committee, magazine committee, modeling, performing, and dancing. We made efficient and effective use of all of our resources. We reached out to different businesses all around Florida and had 8 sponsor our show. We are allotted a certain amount of money from Student Government to help us further fund the event to pay for things such as renting the venue, tech equipment, decorations, flyers, and food. We also used the Vietnamese Association of Gainesville (VAGF) as a resource and professors on campus to help spread the word about our event. We marketed our event by creating an event page on facebook and handing out over 500 flyers on campus and local businesses within Gainesville. We made a tarp that was displayed by our Student Center for a week long leading up to the event. Choreographers, committee members, and officers flyer faced two weeks prior to the event. We also used facebook to host a contest that gave out two gift cards to Korean BBQ and required that you must attend the event to claim the prize (8,700+ entries). We lastly marketed the event to families around Gainesville through VAGF as mentioned before and other professors by requesting the Vietnamese teaching professor send out an email in her department. 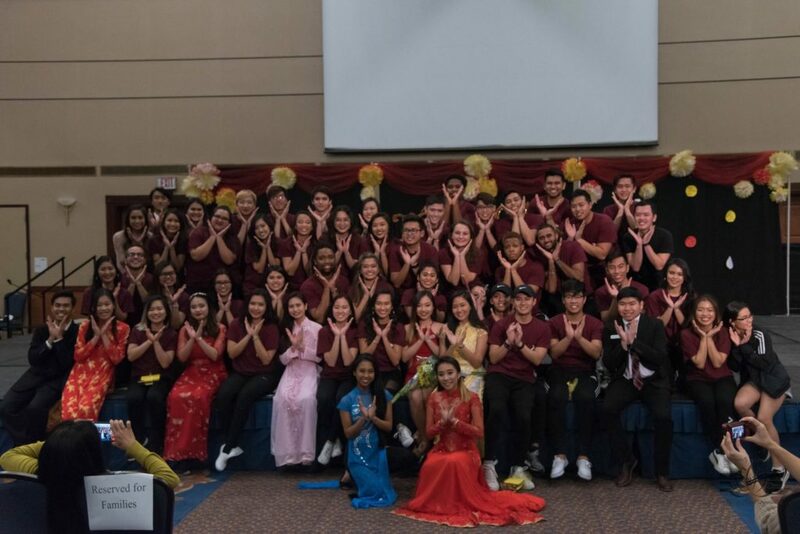 This cultural program served both the campus and the community by aiming to educate individuals on how the Vietnamese new year is celebrated. We achieved this goal by making a skit that went throughout the show about a Vietnamese food folktale, showcasing the different traditional ao dai, traditional Vietnamese games in the hallways and different cultural dance pieces (fan, umbrella, and rice hat). At the sign in desk we had a lot of people show up who have never been introduced to VSO prior to the event but heard about it from a friend or seen the event on Facebook and wanted to learn more. Through these interactions, we were able to not only showcase our organization but our culture as well. This event also allowed members to get more in touch with their Vietnamese culture. We all may have different upbringings but this event has allowed us to come together to put on an event that showcases our culture in a fun and interactive way. Students were able to dance in traditional pieces and participate in skits that taught them some history of Vietnam. Communication is what helped us overcome the challenges we faced. There were times when things were not finished when they needed to be, but with proper and thorough communication we were able to ask for help. Communicating that you needed help with a project or issue allowed us to get more perspectives on how we can solve it. There was an incidence where we were missing one of the black drapes for the backdrop of the stage, but with quick thinking and getting ideas on how we can change the decorations, helped fix that problem instantly.